black olives, tomatoes and baby pickle. The Japanese lunch box is my latest obsession. It satisfies my desire for organization. It rewards my love of tasty food. And it eases my conscience, pricked by the number of plastic sandwich baggies I was using. My bentos aren’t works of food art. I can’t be the mother turning rice balls into cute panda faces when I’ve got four lunches to pack every morning, but I can aim to provide a diverse, healthy lunch in a box. During my learning curve, I spent oodles of time scouring the Internet for teeny tiny sauce bottles and leak-proof plastic boxes while my family suffered soggy sandwiches, spilled sauces and jumbled messes. As lunch menus expanded, my frustrations with the endless chores and clutter that accompany a big family were shrinking. 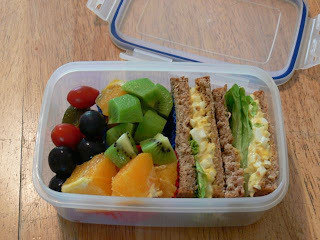 As silly as it sounds, achieving order over the lunch box allowed me to let other things go. And with time my bentos are becoming diverse, healthy lunches. It’s evident each day I achieve this goal — boxes come home empty, and my family is happy because, my husband confides, a beautifully packed bento is a work of love. Many thanks to Lunch in a Box for its wealth of knowledge and inspiration.